After my first self-drafted A-line skirt was such a success I simply had to make another one. I used the same basic pattern and adapted it so that it features a waistband, button front placket and inset pockets. It results in a very different look. I am really enjoying this pattern drafting business and am already dreaming about yet another version that may or may not include a lined vent. 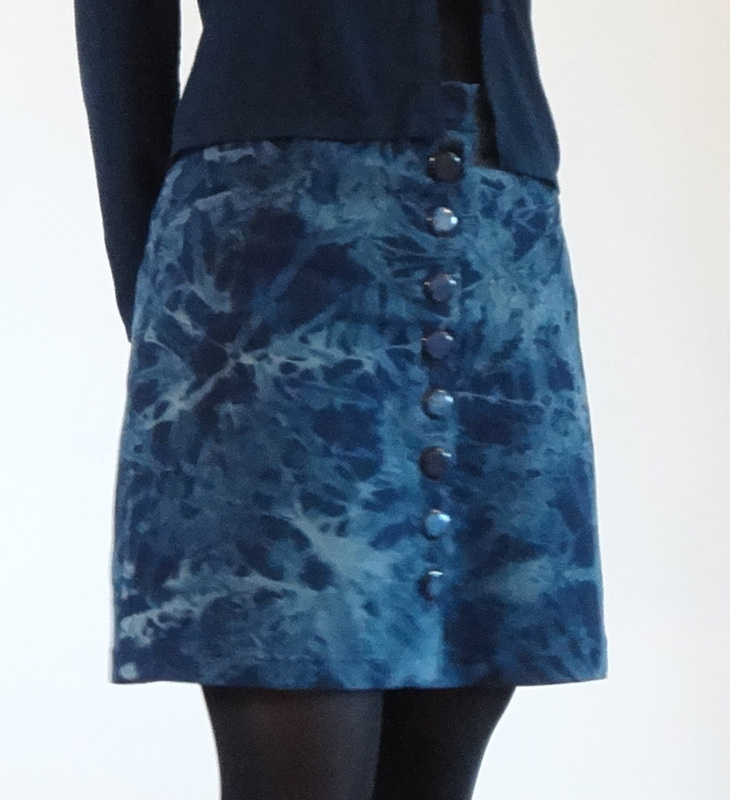 This skirt was inspired by the Colette Beignet and Megan Nielsen’s Kelly skirt. Instead of spending money on a pattern and a lot of time getting it to fit right it seemed much easier and faster to draft my own and it was. 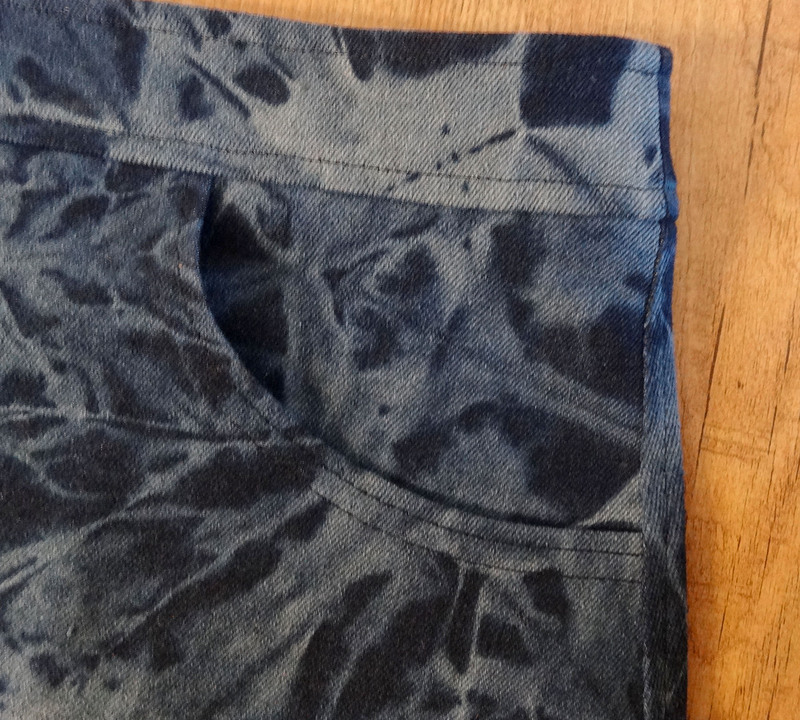 I used a denim fabric with some stretch that I can only describe as looking splotched with bleach. The pattern placement looked rather random so I did not attempt any pattern matching and I think it turned out fine (May and Patrick might disagree though). The buttons are from my stash and I think they are a perfect match for this fabric. The waistband closes with a hook. I sometimes struggle to get my buttonhole foot to behave on parts that are a bit more bulky and I didn’t feel like doing that yesterday. I made the pockets a bit deeper on this skirt than on my previous version and I think this is an improvement. The opening of the pockets is finished with my coverstitch machine as was the hem. I just love those neat rows of double stitching. For the finish of the waistband facing on the inside I tried something new. In some of my RTW jeans the bottom edge of the waistband facing is finished with bias tape and I really like that detail. It is a neat finish and because the seam allowance isn’t folded to the inside of the waistband to hide it, it is far less bulky than what I used to do. It made topstitching the waistband a breeze. It also adds a fun touch of colour that only the wearer of the garment will see. For those of you that would like to add a button front placket to an existing skirt pattern I’ve made a schematic that shows how I changed my pattern. The important things when drafting are how wide you want the waistband to be and how much overlap you want between the front skirt pieces. For a 4 cm overlap you first measure 2 cm (so half the measurement of the final overlap) from the center front and then add another 4 cm for the facing. I interfaced the facing before folding it to the inside. Don’t forget to add seam allowances to the top of the skirt and the bottom and center front of the waistband after cutting the pattern in two when you are working with a pattern that has the seam allowance already included in each pattern piece. I’ve already contacted Selma and I hope she will enjoy making her first quilt!